Peripheral nerves are highly regenerative, in contrast to the poor regenerative capabilities of the central nervous system (CNS). Here, we show that adult peripheral nerve is a more quiescent tissue than the CNS, yet all cell types within a peripheral nerve proliferate efficiently following injury. Moreover, whereas oligodendrocytes are produced throughout life from a precursor pool, we find that the corresponding cell of the peripheral nervous system, the myelinating Schwann cell (mSC), does not turn over in the adult. However, following injury, all mSCs can dedifferentiate to the proliferating progenitor-like Schwann cells (SCs) that orchestrate the regenerative response. Lineage analysis shows that these newly migratory, progenitor-like cells redifferentiate to form new tissue at the injury site and maintain their lineage, but can switch to become a non-myelinating SC. In contrast, increased plasticity is observed during tumourigenesis. 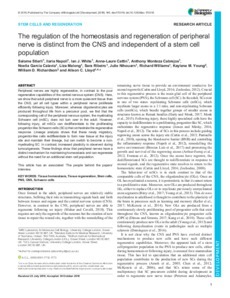 These findings show that peripheral nerves have a distinct mechanism for maintaining homeostasis and can regenerate without the need for an additional stem cell population.This article has an associated 'The people behind the papers' interview.